For reference, here’s the post from last year’s installation: #3: Installing the bees. We’d ordered six new three-pound packages of bees back in the beginning of March. They’d be in roughly April 15 but I sort of thought it’d be later. Afterall, last year’s bees didn’t come in until April 29th or so. In hindsight, my “thinking” was nothing but wishful thinking. Oopsie. We were out working frantically in the garden on April 1st, trying to get everything settled in that department so that, the following week, we could focus on building some bee equipment. My phone rang. It was Bernie. The bees would be in Friday. As in that Friday. April 6th. Oh, crap. Nothing had been done. No lumber had been bought, no major plans decided, nada. Oh, crap. Oh, crap. Oh, crap. Wait a minute… Bernie’s quite the jokester and it was April Fool’s Day. Ha ha ha!! Yeah, good one, Bernie. Good one. Man, you really had us going for a few hours. Whew. Glad that was just a joke. But he never called back to tell us he was kidding. Oh, crap. Oh, crap. Oh, crap. You remember I mentioned that we wanted to build all of our own equipment this year and do some experimenting with various non-standard set ups? Yeah, that went right out the window. Monday was booked with something else. Tuesday was booked with something else. And so on. Oh, crap. Thursday, we waved the white flag and the kids & I headed over to Dadant to make some last-minute purchases. We’d still build some of the equipment but decided it would be better for our sanity (and sleep) to go ahead and buy the fiddly stuff that doesn’t cost much. We bought two medium hive boxes, a case of medium frames, and some boardman feeders. We’d make — or make do with — what we already had on hand for the rest. Leftover from last year, we had four deep boxes and some medium frames. Steve cut those down to mediums one evening. Charlie & I put those and the two new ones together the next day and painted. Friday, Steve started building the screened bottom boards and telescoping covers from scratch while Charlie & I nailed together frames. Steve’s work on the bottoms & tops saved us a ton of money and he made them even better than what we could have bought — customized to our own desires. This year, we decided to go with all medium boxes so everything is interchangeable. We also decided to go foundationless. 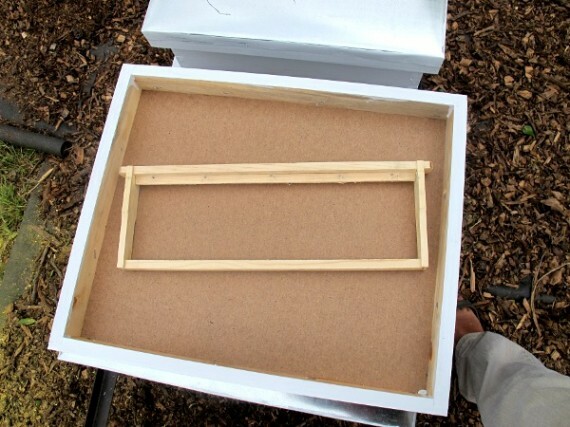 Medium boxes also come in handy for that — deeps can mean a lot of heavy comb with no foundation supporting it ==> good chance of sagging & dropping. Mediums seem to do much better in that respect, as well as being strong enough to extract. I know, I’ve read all of that about all foundationless being too weak to extract, too. But further reading from people who are actually doing it? They say it can be done — and they’re doing it. You just have to do it a bit slower. So back to the foundationless frames: The leftover frames from last year were grooved mediums. (We thought we’d bought shallows last year but, nope, they’re mediums. That particular screw up works out in our favor.) The grooved have a groove across the top bar that your plasticell foundation normally snaps into. 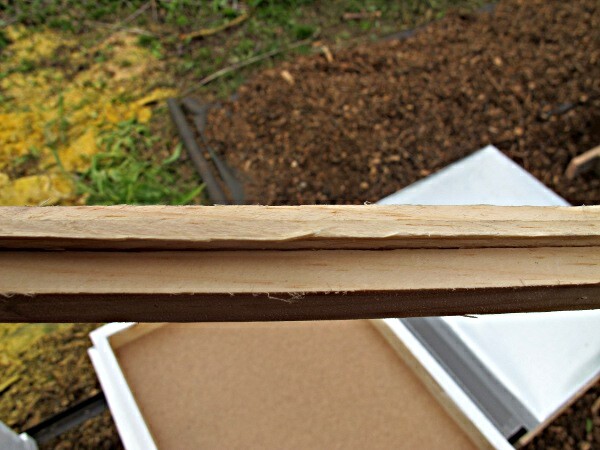 Steve ripped some wood scraps down for us and we nailed them into the grooves for the bees to use as a starting point. The frames we bought this year, however, are wedges. They have a little piece of wood that pops out, you place your plasticell foundation against the piece that is left, then nail in the wedge bar against that. I know the beekeepers know what I mean but I’m attempting to explain it to the nonbeekeepers — and probably just further confusing them. In short, we had two separate types of frames but they all ended up with a thin piece of wood hanging down across the top. From what I understand, the bees hang down from that little piece of wood (festooning — kind of like when ants make bridges from their own bodies for the other ants to cross). They do that from that lower, thin piece of wood and use their own dangling bodies as a plumb line. From that, they’ll build straight if you’ve leveled the hive properly. I’m excited you’re going foundation-less! I haven’t done it myself, but from pictures I’ve seen of others who’ve done it, it’s absolutely beautiful to watch the bees draw our their own foundation from scratch. As an added bonus, they make the cell sizes exactly to their preference. Do post pictures as they get to drawing it out. When extracting foundation-less frames, my friends who go foundation-less say just spin the extractor a little slower than normal, and you’ll be fine! Chris, that’s what I’ve been told, too. Just go a bit slower, and no problems. I’ll take lots of pics! I can’t wait to see it happen!